Vienna, September 25, 2014. Sister Vassa (Larin) has lived the Orthodox monastic life for twenty-five years. She received her Masters Degree in Orthodox Theology from the Ludwig Maximilians University of Munich, where she also received her doctorate degree in 2008 under the direction of Robert Taft, S.J. Since January 2009, she teaches Liturgical Studies at the University of Vienna. 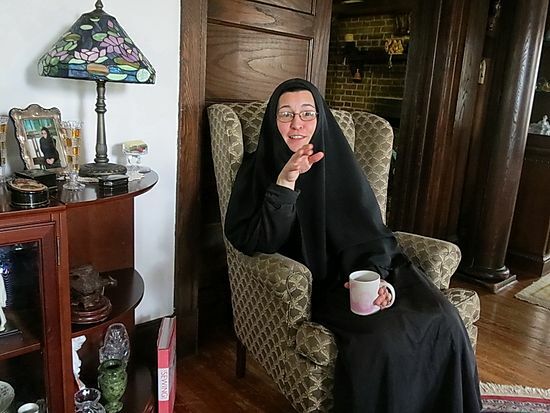 Sister Vassa also hosts the popular youtube show “Coffee With Sister Vassa,” where she discusses liturgical, ecclesiastical and spiritual topics. Deacon Andrei Psarev: What does it mean for you as a nun and scholar to communicate with a world wide audience via your YouTube channel? Sister Vassa: I see this kind of communicaton as my “obedience“ (or “poslushanie“, as we say in Russian) and also my obligation. Because my spiritual father and archbishop, Vladyka Mark of Berlin and Germany, both sent me to receive academic degrees in theology, and later blessed me to take on a teaching position at the University of Vienna. He also blessed me to make these videos, as part of my academic activities. He did not send me to get a doctoral degree just to stimulate my own brain cells or to decorate my CV. I was blessed to receive a theological education to be of service to others; to share this gift with others. Today in academia it is becoming increasingly popular for professors to offer courses online, as a service to the larger public. However, as an Orthodox Christian in academia, I am not only a member of the academic community, but also a member of the Church. So, just like the rest of us within the one body that is the Church, I try to make myself useful in the way that I can. As far as the world-wide audience is concerned, I am grateful for it. I never expected to have viewers volunteer to translate the videos into the many languages we now have in the subtitles: Russian, Greek, Serbian, Spanish, Romanian, Bulgarian, Ukrainian, Slovak – and occasionally Japanese, Portuguese, Georgian, Hungarian, Finnish, and even Arabic. We have received letters of thanks from war-torn Syria, from South Africa, and many more from Russia, Serbia, and Greece – even from Mount Athos. Christ calls us all to “Go and teach all the nations…“ Both men and women answered that call in the Early Church with great enthusiasm. Even the Samaritan woman in the Gospel – a sinful woman – managed to convert her entire village to faith in Christ, by spreading the word about Him. So, if today we are able to spread His word through the internet, as well as the word about His saints – then I think we can be nothing other than grateful for that opportunity to answer Christ’s call. DA: You have a substantial support base within the Russian Church Abroad. In which ROCOR communities have you made “coffee affiliated” presentations? Can you tell us some of the encouraging comments that came from the ROCOR audience? SV: I have only given one talk in a ROCOR parish, and that was at Fr. Victor Potapov’s Cathedral of St. John the Baptist, in Washington, DC. That talk was a great blessing for me, not only because Fr. Victor and his parishioners were very welcoming, but also because the talk was given in the presence of the Kursk icon of the Mother of God. I will not repeat the comments of the audience, because the entire talk, as well as the audience’s comments, was filmed and is available on YouTube, entitled “Living Tradition in the City.“ It can be accessed at: https://www.youtube.com/watch?v=tbGsoaEcYJo. I have also accepted an invitation to speak at the ROCOR St. Herman’s Conference in Cincinnatti, as well as several ROCOR parishes in the Chicago Archdiocese, at the end of this upcoming December and the beginning of January. D.A: You were raised in the Russian Church Abroad and have lived in traditional ROCOR convents in Lesna and in Jerusalem. You speak the same cultural language as some of us who might find it problematic that a ROCOR nun is “running a YouTube show.” Could you explain what you do so that a member of our Church will better understand the need for such work? S.V: I think I explained that sufficiently, in reply to your first question. But I am not sure what you mean, since I don’t know any ROCOR members who find the show “problematic.“ In any event, this surprises me. Nobody from our Church has ever approached me with such a comment. After all, our Church has several YouTube channels, and various members of the Church appear in these videos. For example, Fr. Victor Potapov’s parish regularly posts very interesting videos of talks given at that parish – talks given by monastics and laypeople. There is also humorous content in some ROCOR videos, such as the video of the Eastern American Diocese entitled “Orthodox in Dixie.“ So, it is apparently OK for our Church to have YouTube videos, and it’s also apparently OK for members of our Church – monastic and otherwise – to appear in them, also in a humorous context. If, perhaps, you mean that only my videos, specifically, are “problematic,“ because I happen to be a female monastic – then you will have to find the Gospel about the Samaritan woman “problematic,“ among other passages in the New Testament, because there, in the New Testament, we see various types of women spreading the good news about Christ. Of course, those women did not use YouTube, because they did not have that resource. But I do have that resource. And I use it, just like other members of my Church. D.A: You are fluent in contemporary theological, academic and social trends. How does your ROCOR background help you in your work? S.V: My ROCOR background helps me in everything, not only my work. Because it is the Church that baptised me, taught me its traditions as well as love for them, accepted me into monasticism, heard my confessions and raised me up again when I fell (and continues to do so), and blessed me to study. I also experienced, together with my Church, the very unique changes we underwent, as ROCOR members, when our Church opened up to communion with other Orthodox Churches. Our Church had the humility and wisdom to change, and to open up to the broader world of Orthodoxy; to open up after many years of a very isolated existence. I find myself still processing this immense transition, and learning from it. I now cross paths with other Orthodox jurisdictions on a regular basis, and am often very impressed by the vibrant church-life that I observe there. This kind of capacity to change, demonstrated by our Church in recent years, is very unique in the history of church divisions, and I am grateful to be part of it.